CLICK Discrete Input Module - CLICK discrete input module, 8-point, 12-24 VDC, sinking/sourcing, 2 isolated common(s), 4 point(s) per common. Removable terminal block included. CLICK Discrete Input Module - CLICK discrete input module, 8-point, 3.3-5 VDC, sinking/sourcing, 2 isolated common(s), 4 point(s) per common. Removable terminal block included. CLICK Discrete Input Module - CLICK discrete input module, 16-point, 24 VDC, sinking/sourcing, 4 isolated common(s), 4 point(s) per common. Removable terminal block included. CLICK Discrete Output Module - CLICK discrete output module, 8-point, 3.3-27 VDC, sinking, 2 isolated common(s), 4 point(s) per common, 0.3A/point. Removable terminal block included. CLICK Discrete Output Module - CLICK discrete output module, 8-point, 12-24 VDC, sourcing, 1 isolated common(s), 8 point(s) per common, 0.3A/point. Removable terminal block included. CLICK Discrete Output Module - CLICK discrete output module, 16-point, 5-27 VDC, sinking, 2 isolated common(s), 8 point(s) per common, 0.1A/point. Removable terminal block included. CLICK Discrete Output Module - CLICK discrete output module, 16-point, 12-24 VDC, sourcing, 2 isolated common(s), 8 point(s) per common, 0.1A/point. Removable terminal block included. CLICK Discrete Combo Module - CLICK discrete combo module, Input: 8-point, 24 VDC, sinking/sourcing, Output: 8-point, 5-27 VDC, sinking, 0.1A/point. Removable terminal block included. CLICK Discrete Combo Module - CLICK discrete combo module, Input: 8-point, 24 VDC, sinking/sourcing, Output: 8-point, 12-24 VDC, sourcing, 0.1A/point. Removable terminal block included. CLICK Discrete Input Module - CLICK discrete input module, 8-point, 100-120 VAC, 2 isolated common(s), 4 point(s) per common. Removable terminal block included. CLICK Discrete Input Module - CLICK discrete input module, 8-point, 24 VAC/VDC, sinking/sourcing, 2 isolated common(s), 4 point(s) per common. Removable terminal block included. CLICK Discrete Input Module - CLICK discrete input module, 16-point, 24 VAC/VDC, sinking/sourcing, 4 isolated common(s), 4 point(s) per common. Removable terminal block included. CLICK Discrete Output Module - CLICK discrete output module, 8-point, 17-240 VAC, 2 isolated common(s), 4 point(s) per common, 0.3A/point. Removable terminal block included. CLICK Relay Output Module - CLICK relay output module, 4-point, 6-240 VAC/6-27 VDC, (1) Form C, 4 isolated common(s), 1 point(s) per common, 7A/point. Removable terminal block included. CLICK Relay Output Module - CLICK relay output module, 8-point, 6-240 VAC/6-27 VDC, (1) Form A, 2 isolated common(s), 4 point(s) per common, 1A/point. Removable terminal block included. CLICK Analog Input Module - CLICK analog input module, 4-channel, current, 13-bit, input current signal range(s) of 0-20 mA, external 24 VDC required. CLICK Analog Input Module - CLICK analog input module, 4-channel, voltage, 13-bit, input voltage signal range(s) of 0-10 VDC, external 24 VDC required. 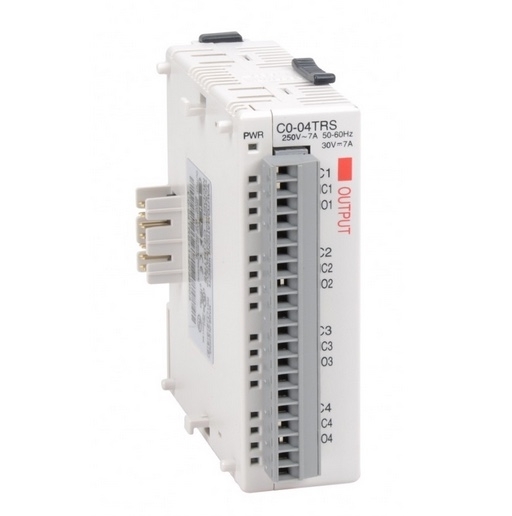 CLICK Analog Output Module - CLICK analog output module, 4-channel, current, 12-bit, output current signal range(s) of 4-20 mA, external 24 VDC required. CLICK Analog Output Module - CLICK analog output module, 4-channel, voltage, 12-bit, output voltage signal range(s) of 0-10 VDC, external 24 VDC required. CLICK Analog Combo Module - CLICK analog combo module, Input: 4-channel, current, 0-20 mA, Output: 2-channel, current, 4-20 mA. CLICK Analog Combo Module - CLICK analog combo module, Input: 4-channel, voltage, 0-10 VDC, Output: 2-channel, voltage, 0-10 VDC. CLICK Temperature RTD Input Module - CLICK temperature input module, RTD, 4-channel, 16-bit resolution, input RTD type(s): Pt100, Pt1000, JPt100, Cu10, Cu25 and Ni120. Removable terminal block included. CLICK Temperature THM Input Module - CLICK temperature input module, thermocouple, 4-channel, 16-bit resolution, input thermocouple type(s): J, E, K, R, S, T, B, N, C. Removable terminal block included. CLICK AC Power Supply - CLICK AC power supply, 100-240 VAC nominal input, 24 VDC nominal output, 0.5A continuous. CLICK AC Power Supply - CLICK AC power supply, 100-240 VAC nominal input, 24 VDC nominal output, 1.3A continuous. CLICK Terminal Blocks, 3-pole - CLICK terminal blocks, replacement, 3-pole. Package of 2. For use with CLICK standard and analog PLCs. CLICK Terminal Blocks, 4-pole - CLICK terminal blocks, replacement, 4-pole. Package of 2. For use with CLICK PLCs. CLICK Terminal Blocks, 11-pole - CLICK terminal blocks, replacement, 11-pole. Package of 2. For use with CLICK 8-point I/O modules. CLICK Terminal Blocks, 20-pole - CLICK terminal blocks, replacement, 20-pole. Package of 2. 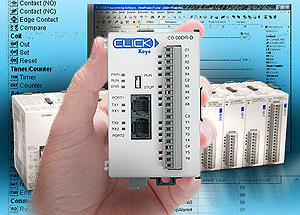 For use with CLICK 16-point I/O modules and CLICK PLCs built-in I/O. CLICK Windows programming and documentation software, CD or free download. For use with CLICK C0 series PLCs. Click user manual, free download only. For use with all CLICK CPUs and I/O modules. 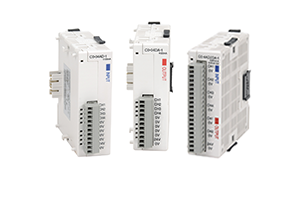 The CLICK PLC family of components offers practical PLC features in a compact yet expandable design, with super easy-to-use FREEprogramming software. CPU units start at just $119.00. The CLICK PLC control system does not require a mounting base, which saves on space. 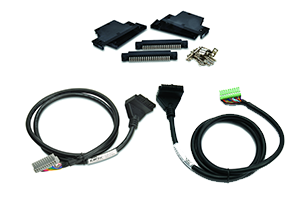 The CLICK CPU and I/O modules are connected together via an expansion port on the sides of the modules. 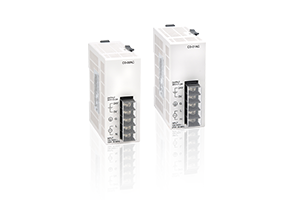 Or, the PLC system can be expanded with the addition of up to eight I/O modules. A variety of I/O modules are available for flexible and optimal system configuration. The I/O numbering system is decimal. 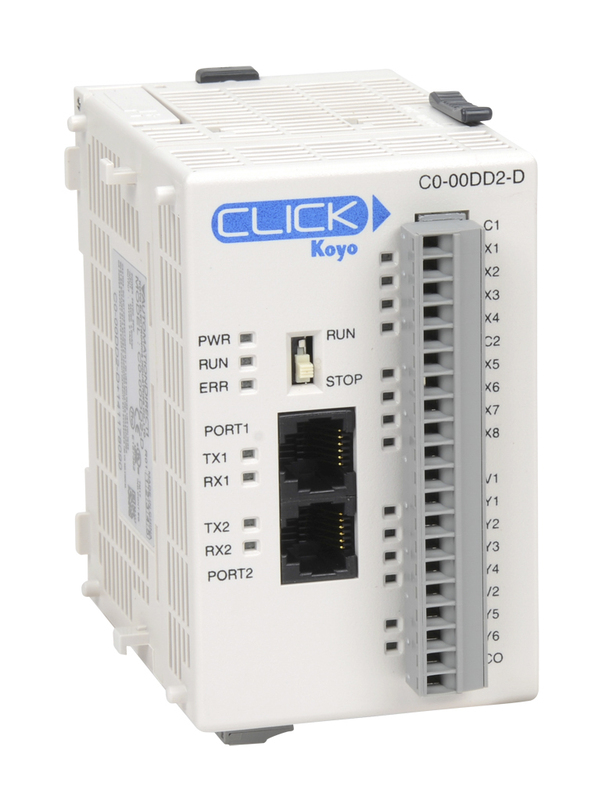 The CLICK CPUs have two built-in RS-232 communications ports. 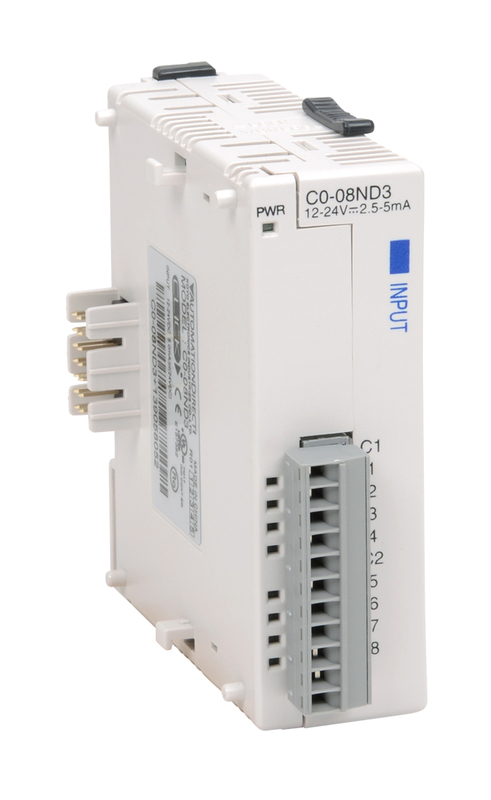 Can be configured for either MODBUS RTU or ASCII networks. Analog CPU modules have built-in analog I/O (2-channel analog inputs and 2-channel analog outputs). Each channel can be separately set for voltage (0 to 5 VDC) or current (4 to 20 mA). Analog CPU modules include the real time clock and battery backup for the internal SRAM. Battery allows data to be stored for 5 years. Provides ease of use and quick learning. The CLICK PLC supports a very simple, but useful instruction set. The 21 easy to use instructions can cover most applications that are suitable for this class of PLC. 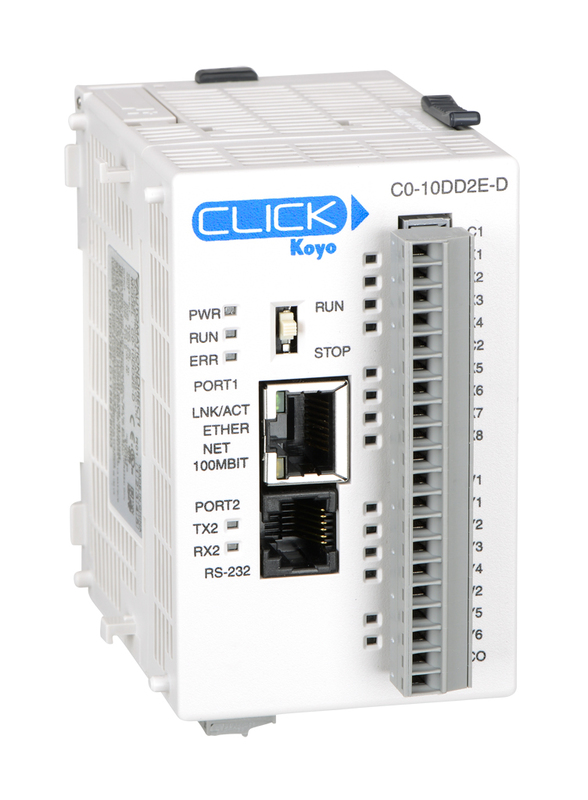 Download the FREE CLICK PLC Programming Software Now! If your PC has a USB port, use cable EA-MG-PGM-CBL to connect to the CLICK CPU module port. 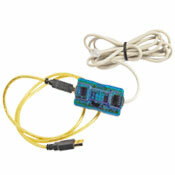 If your PC has a 9-pin serial communications port, use programming cable D2-DSCBL.